I have been seeing homemade ice creams, sorbets, granitas and sherbets popping up on food blogs all summer long and it’s been driving me bonkers! I really, really wanted to make some ice cream but I also didn’t want to find all the ice cubes needed for my ancient-but-oh-so-beautiful turqouise ice cream maker. I wondered if it was possible to make ice cream without an ice cream maker? And then I remembered that last year I did make a Seville orange ice cream sans and it turned out just fine indeed. 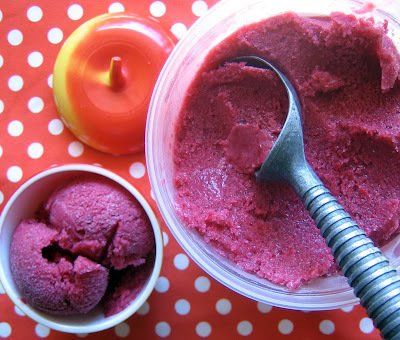 It’s cherry season around here and I had some dark, sweet Bing cherries from the Okanagan just waiting to be used up…perfect for an icy treat. I also had buttermilk in the fridge and figured it would add the perfect amount of creamy tang to this sherbet. From the photo above, I obviously didn’t have a cherry pitter*, so I just used a knife to un-pit the cherries. They were going to be blended up so I wasn’t looking for intact-looking cherries. I just put on some loud music and got my pitting groove on! Once you finish pitting, the hard part is over. The ingredients are easy enough to come by and the process is simple. I didn’t strain the liquid after blending which would have removed the cherry skin, but I actually liked the added texture of the itty-bitty nubbly bits. If you don’t, go ahead and strain the mixture before adding in the sugar. Now, the only thing you have to do is wait it out…and the wait can be a bit of a buzz-kill, especially when it’s really, really hot outside. However, once the wait is over, scoop on in. The resulting sherbet is ripe and bursting with cherry flavour: it’s heady and gorgeous in taste and well, just look at the damn thing! It’s beautiful and it scoops like a dream. Enjoy this now while cherries are at their peak. I mean it, just do it. * Uh, little did I know, I did have a cherry pitter. Cornelius brought it to my attention. He inherited it from his grandma and it sat unbeknownst to me in our drawer of strange kitchen things. Next time. Pit the cherries and place into a medium-sized saucepan. Add in the juice and bring to a boil. Lower heat and simmer until cherries are soft, about 20 minutes. Use a hand blender or transfer the hot mixture to a blender and blend well until everything is totally liquefied. Stir in sugar until it has dissolved completely. Refrigerate for at least 1 hour. When the cherry mixture has chilled, add buttermilk, bourbon, almond extract and lime juice and stir to combine. If you have an ice cream maker, pour into maker and churn. Otherwise, pour mixture into a large rectangular cake pan and put in the freezer. Whisk the mixture every hour or so until it sets. Transfer to a lidded container and freeze for at least 4 hours. Oh my. I just almost licked my screen. I love the idea of using buttermilk. I bet that adds a lovely tang. NO ice cream maker needed??? sign me up!! I LOVE cherry ice cream! And cheers to the joy of being able to make homemade ice cream without an ice cream machine. I made the honey semi-freddo from Nigella Lawson's Forever Summer (no churning required! ), and it turned out beautifully. I didn't plan on keeping it as a stash of ice cream in the freezer, but that's what happened, and I don't regret it. Not one bit. By the way, if anyone decides to track down the semi-freddo recipe, be warned: it's VERY sweet, even without the extra honey drizzled on top at serving time. I think next time I'll cut the honey to 5 or 6 tbsp. total. 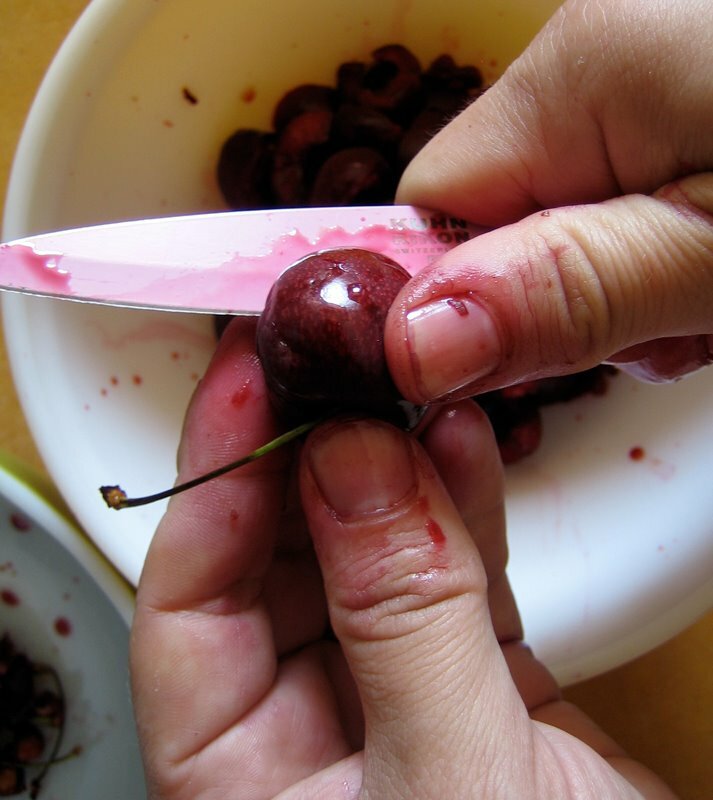 That photo of your knife and the cherries looks murderous … in the most delicious way. I agree with Jess, buttermilk sounds fantastic. Oh my gosh, thank you! our ice-cream maker is missing a part and we haven't had the time to get a new one or look for the missing piece. what a great color those cherries make! YUMMM Cherry icecream! It looks so cool, and It is so hot, I want to jump right into the bowl! Another wonderful recipe with beautiful photos. As I type, me and my kids are dripping sweat all over the place, and my son just retrieved 3 bags of frozen veggies from the freezer so we don't die of heat. We're typical Northwest wimps. I don't even usually like cherries, and I want a big scoop of that RIGHT NOW. (And thank you.) Gorgeous, gorgeous color! I literally bought an ice cream maker this weekend and made my first successful batch tonight (vanilla froyo)! However, I'm more impressed with your homemade efforts sans machine! I heart cherries and buttermilk, so this must be exceedingly good. Oh, and bust out that cherry pitter, because they are fun to use! Gah — I followed the link through to the photo of your turquoise ice cream maker and was surprised to see what looks like an exact replica of one I grew up with. 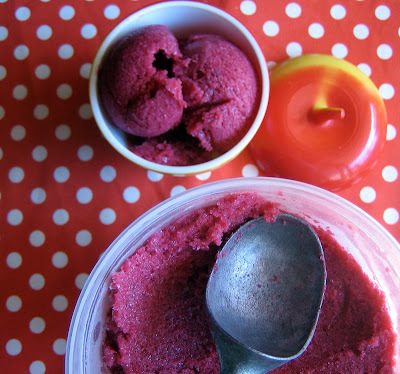 We throw a little homemade ice cream making party every summer, and I'm thinking that cherry buttermilk sherbert should be one of this year's 2 options. WOW – that looks so refreshingly fantastic. Cherries are my favorite summer fruit — bookmarking this yumminess now! Can you believe the cherries we are getting this year? They are so incredible and so cheap. I have always loved them but not in desserts. But I know I would like this, just pure cherry flavor with a bit of tang. Perfect. Thanks Jess, it's a pretty perfect summer treat! Thanks for the tip, rosiecat! Vanessa, this is so easy…it's just the waiting that is hard. Hag, it's perfect! Jump on in. Thanks leftoverist! I'm also a huge weather wimp. Crazy heat. Shannalee, you don't like cherries?? Really? Linda, all ice cream is reason to celebrate. Mari, I tested out the cherry pitter this week and it was fun! Casual baker, yes, make it happen. I love ice cream parties!! Thanks cookiepie. It is indeed lovely & yummy! Corie, let me know if you do. I think it would work fine with frozen cherries. Just defrost them first and save the liquid to use in place of the pomegranate cherry juice. Dana, I know, they are so cheap and readily available, it's great. That sherbet looks incredible! I'm having a housewarming this weekend, and think I might have to make it. 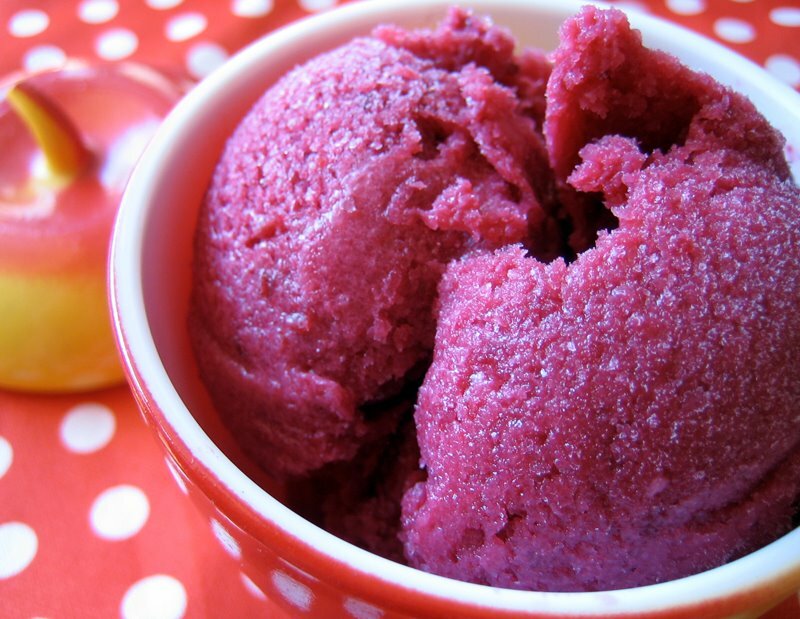 One question – do you think it would work with frozen cherries? That sherbet looks so good!! I have a cherry pitter but I find it a bit fussy to use at times. Sometimes it is just faster to use a knife. I went raspberry picking in my parent's backyard recently and came home with two yogurt tubs filled with raspberries. I wonder if I can use your recipe to make raspberry buttermilk sherbet? Looks fantastic! My pitting sans-pitter method of choice is using the blunt end of a chopstick to poke them out. Works lovely. that looks so fantastic! thanks for having a recipe with no ice cream maker too…i always see these fantastic recipes and then its like "freeze in ice cream maker according to manufacturer's directions". Excellent way to use those cherries. Buttermilk & cherries! What a perfect combination. Bijoux, yes, i'm sure it would be delicious with raspberries. I think you'd want to strain out the seeds though. Good luck! Ayla, heard that was one great way to pit a cherry! The Twins, enjoy…without a maker! Hooray. Thanks Bellini, I think so too! Laura, I sure think so. Could this work without the sugar or with honey? Anon, sugar is necessary in that it prevents the sherbet from freezing too hard, but you could certainly use less sugar (or use agave nectar instead). This sounds fabulous! Ive not had a sherbet like this before with buttermilk!! and the NO ice cream maker sold me over! Rose & Thorn, it makes for a perfectly lovely treat. Hooray Jennifer! It's perfectly easy to make without an ice cream maker. Try it out. Even my husband is spreading the word on how easy it is. Perfect for cherry season. The sherbet looks fantastic! Hope the heat breaks for ya'll soon. Stay cool! what a pretty picture! looks delicious as well! looks gorgeous and super refreshing!! Thanks Tanya for the tip! I'm happy how the photos turned out too, Apple Hill. Thanks! Haha oh no too bad you didn't realize you had a cherry pitter until after! Oh well now you will truly appreciate it next time. =) Love the sound of this sherbet and the tang the buttermilk added. THANK YOU! Ice cream maker = not an option because I just have too.damn.much.stuff! So what does the bourbon do? Christine, the bourbon adds a bit of flavour but it also adds creaminess without the sweetness. Alcohol stops too many ice crystals from forming. Wait – bourbon?? Well hello! I made this and everyone loved it. The pomegranate adds a complexity that cherries alone wouldn’t have. One person immediately identified the bourbon but no one caught the lime. I thought it was a touch too sweet, but no one agreed with me. My only other issue I’d raise was it took longer than 4 hours to setup, more like 7 hours, but no one cared about that either!